Topic: Should the school sytem allow bible studies in class room's? Topic: It can Happen to any one of us. 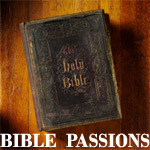 Topic: Anyone Here @ 'Bible Passions' Passionate About The Bible?